FREEHOLD- Borough officials last night said they will attempt to subdue the "spirits in the night" at Lake Topanemus in response to several complaints registered by residents in the area. Several residents of Pond Road and areas adjacent to the lake complained to the Borough Council last night of acts of vandalism, littering and blaring music at the lake from young people in the area. The scenes of night parties, which were immortalized at Lake Topanemus in Freehold-born Bruce Springsteen's song "Spirits in the Night," must now come to an end, according to Mayor J. William Boyle. The lake is referred to as "greasy lake" in the Springsteen tune. "We are going to have to station a police car out there until this stops," Boyle said. "This has gone on for too many years." Dr. Judith Jallowich, of 261 Pond Road, said incidents of drag racing, littering, beer drinking, and drug consumption are "intensifying" at the lake. Jallowich said an effort to lock-up the park has not deterred the night visits. Walter J. Baillic, director of public works, said he has locked the park during night hours, but his actions have drawn criticism from Freehold Township Mayor Arthur Kondrup. Kondrup has repeatedly told the borough the lake is under the jurisdiction of the jointly-municipal Lake Topanemus Commission. Boyle maintains, however, that the borough owns and controls the lake. Thomas D. Skillicorn, of 252 Pond Road, said the residents will attend the next Freehold Township Committee meeting to ask for additional protection. Skillicorn suggested the two municipalities put a wire fence around the lake and surrounding acreage. Boyle said the borough and the townshop are still negotiating with Monmouth County for a possible county takeover of the lake for use as a park. In other business, the council passed on ordinance increasing the fine for littering to $50 for a first offence and $75 for subsequent offenses. The council also authorized the Municipal Court to require guilty parties to work on the borough streets and roads crew in lieu of money or a jail term. 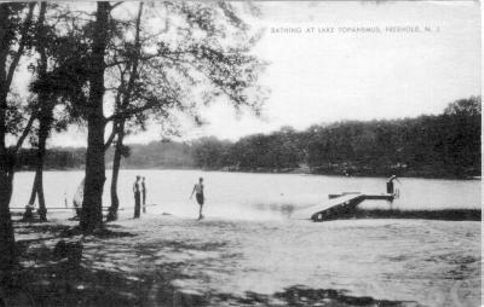 Boyle said the new ordinances will be used against people caught at Lake Topanemus.